Both augmented and virtual reality show no sign of slowing down -- these are certainly technologies to keep an eye on over the next several years. Microsoft and Google have been very public with their projects, while there are rumors that Apple is secretly working on both AR and VR too. Google's Tango is one of the most ambitious such projects, bringing augmented reality capabilities to Android devices. 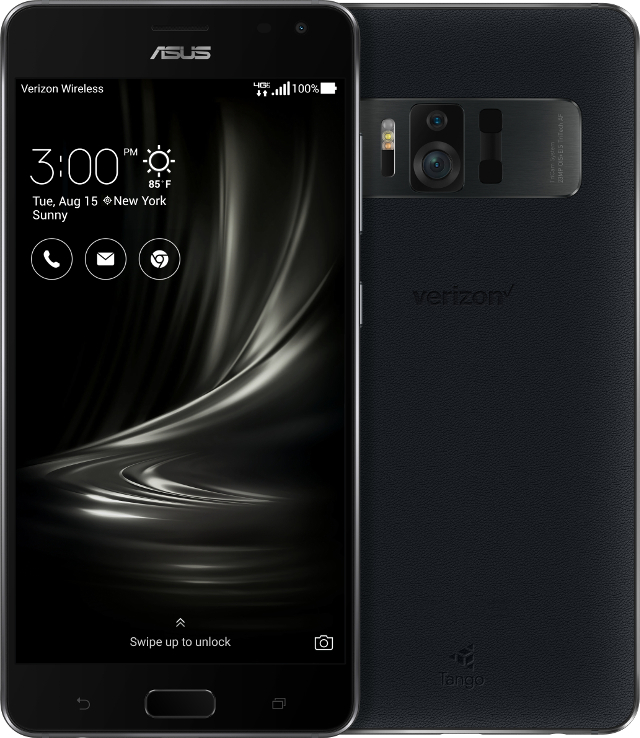 Earlier today at Google I/O, ASUS announced that the upcoming ZenFone AR smartphone -- compatible with both Tango and Daydream -- will be a Verizon exclusive. "Tango is an augmented reality (AR) platform that uses qualified devices to detect their users' positions relative to places and objects around them without using GPS or other external signals. This allows application developers to create AR experiences that include indoor navigation, 3D mapping, and environmental recognition, among other augmented reality applications. Daydream is a high-quality virtual reality (VR) platform that is built into the Android operating system to support VR apps. The ASUS ZenFone AR was developed in close cooperation with Google to deliver the best user experience on both Tango and Daydream platforms," says ASUS. The company also says, "For VR, the large, high-resolution and high-contrast display of the ZenFone AR makes it ideal for VR applications when used as a VR display mounted in the Daydream View headset. The ZenFone AR’s expansive 5.7-inch screen immerses the viewer in whatever VR world is being presented, while the WQHD (1440 x 2560) resolution presents images with extreme clarity and deep black hues enabled by the high-contrast super AMOLED technology which enhances the 3D effect of the screen." While the large Super AMOLED Gorilla Glass 4 display has a solid resolution, the ZenFone AR has other impressive specs too, such as a Qualcomm Snapdragon 821 CPU and an Adreno 530 GPU. It also has 6GB of RAM and 128GB of storage by default. ASUS claims the audio should be exceptionally loud thanks to a 5-magnet speaker system. Of course, the phone will run Android 7.0 Nougat. The main rear camera looks to be very high-end too. ASUS explains, "To help you explore and capture your world, ZenFone AR features a high-resolution 23MP camera as part of its TriCam system. With a large f/2.0 aperture lens, lightning-fast 0.03 seconds TriTech autofocus with subject tracking, and 92MP Super Resolution technology, it delivers beautiful and stunningly detailed photos in any lighting condition. Optical and electronic image stabilization help ensure blur-free shots and 4K video recording lets you capture moments in the highest quality." While we know that it will be exclusive to Verizon, exactly when it goes on sale is a bit of a mystery. ASUS simply says it will be available in the "summer," meaning it could launch at any point in a three-month span. Pricing is also unknown, but it will be revealed later.